Four athletes get big event experience before the World Games. 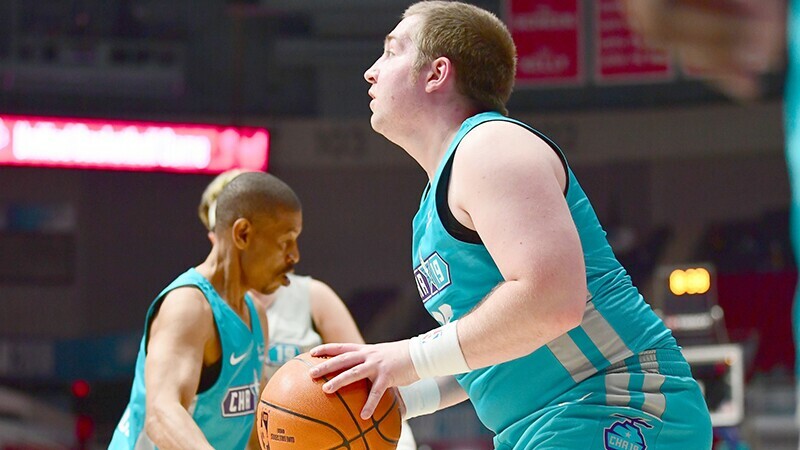 This year’s annual NBA Cares Special Olympics Unified basketball game during NBA All-Star weekend was full of fun, talent and excitement. Special Olympics assembled 12 international players to gather in Charlotte, NC to represent their countries, cities and a global movement of inclusion. The players were broken up into two teams of five Special Olympics athletes, with intellectual disabilities. 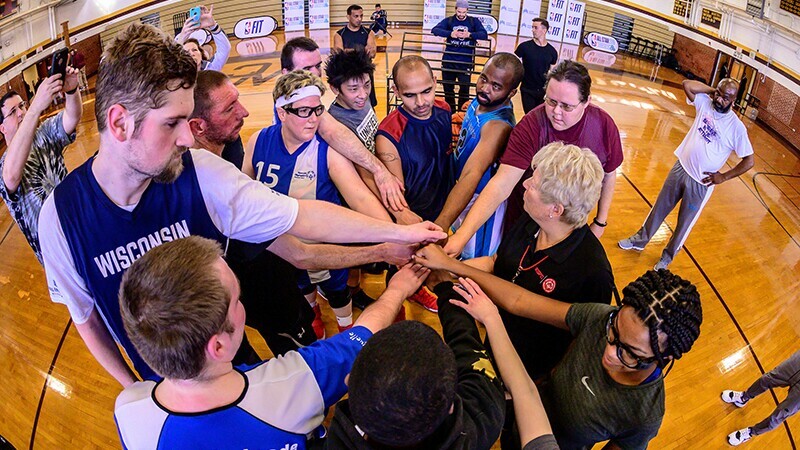 Each team was joined by four international sport celebrities without intellectual disabilities to create a “home” and an “away” team for the Unified basketball game. The away team squeaked out a 1-point victory over the home team with a final score of 27-26. The away team was coached by Boston Celtics Kyrie Irving. of the National Basketball Association (NBA). Portland Trail Blazers Damian Lillard (Special Olympics Global Ambassador) of the NBA coached the home squad. Take a look at this photo gallery to catch a glimpse of the action! Andrew Smilley, Special Olympics Cayman Islands, and Marquise Ledbetter, Special Olympics North Carolina, USA, go for the ball at the same time. Andrew, an experienced World Games competitor in swimming, will travel to Abu Dhabi with his country’s basketball team for World Games this year. Marquise is an avid sports participant who, along with basketball, enjoys track and field, flag football, bocce, cycling and softball. Ashley Aldrich, Special Olympics Massachusetts, USA, strides the practice court. When she was 13 years old, she underwent spinal surgery for 11 hours but that hasn’t kept her from the games she loves. Kyrie Irving is her favorite NBA player. Brendan Connolly, Special Olympics Ireland, practices good form. Brendan recently completed an internship at his local hospital which led to a full-time job. His favorite NBA player is Steph Curry. Retired WNBA player Taj McWilliams tries to catch Didier Drogba, retired international football player from Ivory Coast and Special Olympics Ambassador. Thierry Henry, former international football player from France, watches from the sidelines. Horace Grant, retired NBA player, is taking the game very seriously. Kyle Emery, Special Olympics Colorado, USA poses with Ray Allen, NBA Hall of Famer, after the game. Kyle works with special needs students at a high school. He volunteers at special events and Steph Curry is his favorite NBA player. Coach Kyrie Irving shares a laugh with WNBA player Ashley Battle. Coaches Kyrie Irving and Damian Lillard stand with players Leanne Woolfe, Special Olympics Great Britain and Mikami Hayato, Special Olympics Japan. Both Leanne and Mikami will travel with their national teams to the Special Olympics World Games Abu Dhabi 2019. Michael Wright, Special Olympics Ontario, watches with as much enthusiasm as he plays. Michael will join the Canada team in Abu Dhabi at the World Games 2019. Michael works at Chuck E. Cheese and LeBron James is his favorite NBA player. Micah Gumness, Special Olympics Wisconsin, USA waits on the court with teammates Leanne Woolfe and Dikembe Mutombo. In addition to helping his father coach basketball, Micah works at a paint and coating factory and volunteers for church events. His favorite NBA player is LeBron James. Retired NBA player Muggsy Bogues enjoys the game even while watching. He is seated next to Kellie Hearne from Special Olympics North Carolina, USA. 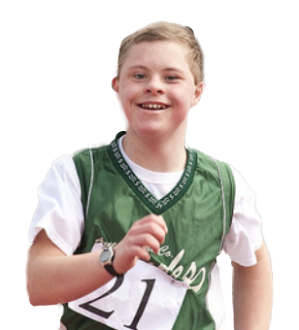 Sebastijan Abel, Special Olympics Germany, is focused on his next move. Sebastijan has been playing basketball for five years and is employed as a warehouse worker. His favorite NBA player is Dirk Nowitzki. Special Olympics athletes pose before the big game. This international group of athletes come from Canada, Cayman Islands, Germany, Great Britain, Ireland, Japan and USA.